If you love pet classes, you’ll be getting a treat soon in AdventureQuest 3D. The Moglomancer class, the final stretch goal in AQ3D’s Moglin plushy Kickstarter, is under development now. Soon you can command those fluffy little friends into battle for you and watch them savagely decimate your foes! But before the class come the accessories. 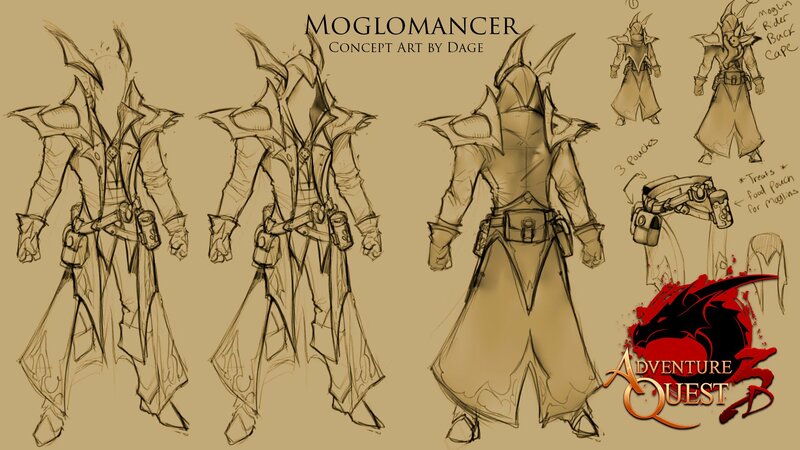 The design notes offered a timeline for remaining in-game rewards to be delivered, starting with the exclusive Moglomancer armor that will be given to all backers and likely going into game this week. One important clarification that Artix Entertainment CEO and head Moglin-wrangler Artix Krieger told us is that the Moglomancer class will be released early access for all backers at the $99 level and above, not $120 as mistakenly mentioned in the design notes. Those who didn’t back will be able to earn the Moglomancer in game sometime later. Wish you could jump on the Moglin bandwagon? Thanks to continuing the campaign with BackerKit, players can still jump in and get all the goodies offered on Kickstarter, which includes the chance to get the get the Moglomancer early in game as well as the rare variant of the armor and the exclusive green Kickstarter Moglin pet, Back-Kick. To answer the question, no, not at all. Paying $99 for early access to free content for a free-to-play mobile mmo sounds like the type of decision-making one should avoid. No, that money is actually to buy Moglin pets in game and Moglin plushies IRL! it isn’t for the early access for the class. You are so right that it wouldn’t be worth it if the pet class was the only thing it bought, it just happens to be a side benefit. Then your title choices were not great. There is more to an article than the title. If you’re reading the title as the way to get your news, you’re going to be severely confused quite often. We see that it’s on the way for certain backers, and you read the article to see what it is that they are backing to get the class. The second sentence in you see what it is that they’re backing. Sure, she could insert the world “plushie” there in the title so it says “$99+ plushie backers”, but it took me 5 seconds to see what it was they were backing and I didn’t just make up something in my mind because the word plushie was missing from it. You can’t give all the information in just the title, you give a dab of info to see if it’s something people are interested in reading. You read the content to get your info. If the above poster we’re replying to read a few sentences in, maybe he wouldn’t be so confused. You mentioned what the Kickstarter was the second sentence in so if people can’t be bothered to read that far and need to comment before that, I don’t know what to say. It’s a PC developed MMO actually. It started on PC first and then they decided to make it a PC and mobile release. Calling it a mobile MMO is not correct. Not only that but the classes and extras are for two games, one is a cross platform MMORPG, the other is a PC only browser MMORPG (AdventureQuest Worlds). And as people mentioned, that was just a stretch goal bonus that they’re giving to people and not what the actual money was for. Basically if you spend that much you’re getting a discount on the physical Plushies and a bunch of extras free with them.